Banks aren’t exactly known for their funny sides. Official communication is very matter-of-fact, and can often be depressingly drab and serious. Not Kotak Mahindra Bank. When Kotak sent out a out an email with the title “Tips for Safe Baking: SMS Fraud” to thousands of subscribers, you’d think it wasn’t a big deal. 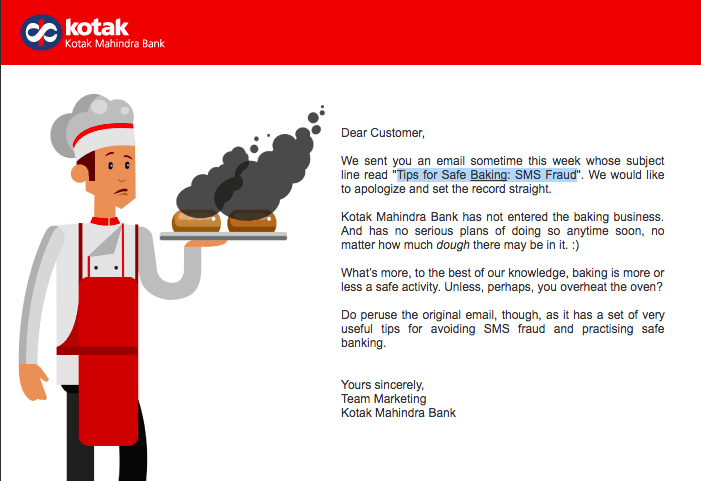 Kotak, obvoiusly, is more qualified to be sending out banking tips instead of baking tips. But instead of sending out a simple clarification in their next email, Kotak took things a notch higher. In a follow up mail, Kotak went the full hog. “Kotak Mahindra has not entered the baking business”, the email reads, while a morose looking baker watches on from the sidelines. “And has no serious plans of doing so, no matter how much dough there may be in it. :)”, the mail continues. A bank that uses mean puns to apologize about a typo? Shut up and take all my money!